The Manjeet Chillar led Rajasthan side will be looking forward to starting with a victory under a new captain. Chillar will partner with ace raider Jasvir Singh. On the other hand, Delhi KC will look forward to a revival in fortunes with their new skipper Meraj Sheykh. The Jaipur Panthers has many talented players like Selvamani K, Somvir, Manjeet who is also an all-rounder. This is the 5th time when Jasvir will be leading the raiding department. On the other hand, Dabang Delhi has got its defence stronger this time. It has got the dynamic duo of Bajirao and Nilesh. on its team. And the Raiders are experienced players likes of Ravi and Rohit. In the last season, Kashiling had to deliver most of the duties. It will be an interesting kabaddi match to watch out for. It will be an indirect game for the finest all-rounders – Manjeet and Meraj. The following television (TV) channels and online streaming sites will telecast and stream respectively. Star Sports 2, Star Sports 1 (Hindi), Star Sports 1 (Tamil), Star Sports First, Hotstar, Star Sports 1 HD, Star Sports 2 HD. This time around, Delhi has got some of the best quality players from the auction. This way, the side has been transformed into a formidable one. The results of the last season will be present in the minds of the players. 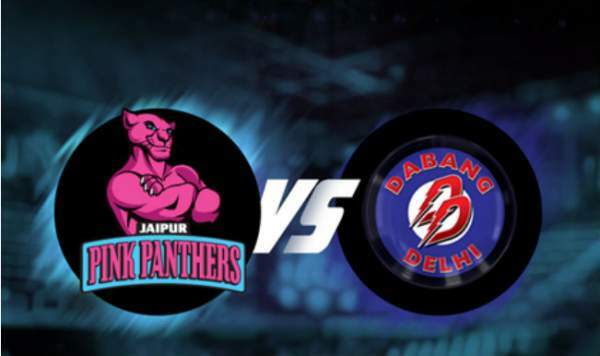 As of now, the Panthers has the strongest partnership in the faces of veteran players – Manjeet and Jasvir. They have the capability to make their side win. And experienced Navneet will surely help his teammates. Delhi has a younger lineup as compared to Jaipur side. It may end up as a match between youth and experience. The experienced players of Jaipur will have an extra edge over Delhi. Defenders: Jae Min Lee, Manoj Dhull, Navneet Gautam, Nitin Rawal, Ravinder Kumar, Somvir Sekhar, Vignesh B.
Defenders: Bajirao Hodage, Nilesh Shinde, Satpal, Sunil, Swapnil Shinde, Tushar Bhoir, Viraj Vishnu Landge. All-rounders: Meraj Sheykh, Chethan S, Rupesh Tomar, Tapas Pal, Vishal, Yatharth. Raiders: Abolfazl Maghsoudlou, Anand Patil, R.Sriram, Ravi Dalal, Rohit Baliyan, Shubham Ashok Palkar, Suresu Kumar, Vipin Malik. The live score, commentary, and all updates will be available. Come back for the match result and highlights. Stay tuned to TheReporterTimes for latest Pro Kabaddi news and all sports updates around the world.